If you’re not familiar with wildly popular Mexican taqueria Chubby’s Tacos, you’ve really been missing out. Chubby’s originated in Durham and has several locations there, but there’s also a sister restaurant in Raleigh’s Lake Boone Shopping Center near Rex Hospital. On any given day near lunchtime, the line out the door starts around 11:30 a.m. That’s because people come in droves for the huge portions, tasty provisions and cheap prices. For just $3, you can get a fish taco as flavorsome as you’ll find anywhere. A 2-ounce side of house-made guacamole will only set you back a buck. You get the idea. Even big eaters will find much to like at Chubby’s, as mammoth burritos and quesadillas provide plenty of sustenance—and likely some leftovers. In the mood for tacos? You can’t go wrong with spicy tinga chiken with onions and chipotle peppers with cilantro. There’s also an eat-all-you-want salsa bar featuring six or eight varieties from mild to hot. If you somehow manage to save room for dessert, must-try items include the dulce de leche quesadilla with sweet cream sauce and cinnamon sugar or the classic fried sopapillas with cinnamon and honey. 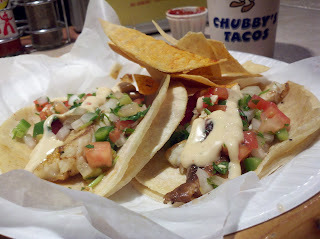 Take it from Lunchboy: Chubby’s is muy excelente!